If you’re new to the gluten-free world, you’re not alone. We’ll start this article by taking a look at foods that you should generally be looking to avoid if you are going gluten-free. Some will be obvious, of course, but it’s important to cover all of our bases. And, if you’re reading this, you no doubt care about your health and exercise routine enough to at least consider making meal replacement shakes a part of your life, so we’ll conduct a comprehensive review of the best gluten-free meal replacement shakes on the market. First, we must point out that you won’t always find food products labeled as “gluten-free.” You might see it noted as such on the front of the label of course, as it’s becoming a more popular type of food item to look for. But companies are not required by law to do so, as they are for allergens such as eggs, nuts, etc. What you’ll want to seek out on the ingredients list are wheat, rye, malt, barley, and brewer’s yeast and oats. Even flours listed as gluten-free should be investigated — is said flour “certified gluten-free”? As is often the case, there are certain foods and ingredients that may surprise you when you find out that they do, in fact, contain gluten. There are types of nuts, chips, soups, and even candy that includes gluten, for instance. Always, always, always check the ingredients list — especially if you have a more serious and diagnosed condition such as celiac disease. Okay, let’s take a quick spin through some helpful guidelines regarding what to look for when you’re on the hunt. Many folks that get into taking meal replacement shakes on a regular basis do so because they lead busy, on-the-go lives and care far too much about their health to simply run through the drive-thru several times a week. Believe it or not, there are plenty of gluten-free meal replacement shakes for weight loss on the market, and even gluten-free, soy-free meal replacement shakes, and gluten and dairy-free meal replacement shakes. As mentioned, meal replacement shakes should be high in calories in order to give your body the fuel it needs to be energetic and successful throughout your day. In a perfect world, your chosen shake would be high in various nutrients. 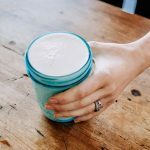 Protein is the most important compound when it comes to building and maintaining lean muscle, so we’ll be keeping an eye out for that throughout this list of gluten-free meal replacement shakes. Alright, let’s get into it. Ladies and gentlemen, the best gluten-free meal replacement shakes. The shake is 400 calories and, shockingly, only includes four grams of sugar. 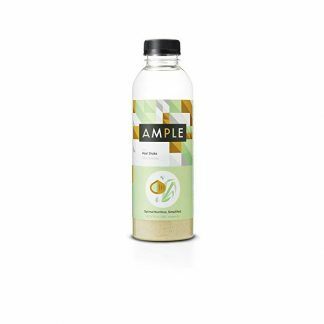 Ample Meal’s flavor is creamy and frothy and includes a hint of sweetness with notes of vanilla and cinnamon all while remaining gluten-free. BioTrust’s grass-fed whey protein powder is gluten-free. But not only that, it’s also soy-free, and non-GMO, checking all kinds of ultra-healthy boxes right off the bat. 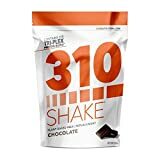 he 310 meal replacement shake option is in line with every other product on this list as being gluten-free, and adds soy-free and sugar-free to its list of allergens that it avoids. The aforementioned premium, grass-fed whey protein comes in an amount of 20 grams per serving, which puts Invigor8 in the upper tier of the gluten-free meal replacement shakes that we reviewed for this article. UB Super Nutritional Shake is made of plant-based proteins derived from yellow pea, organic Salba chia seed, and organic flax seed and hemp. Oh, and it’s gluten-free, of course. Garden of Life is another gluten-free product that is also soy-free and dairy-free. Oh, and if you’re looking for a vegan gluten-free meal replacement shake, look no further. PlantFusion Complete Meal is a plant-based protein powder that comes in either vanilla or chocolate caramel flavors. Kate Farm’s product’s 16 grams of protein is actually organic plant protein geared towards accomplishing goals such as maintaining and repairing lean muscle and encouraging cell growth. Everything from Ample Meal includes ingredients that are completely natural, non-GMO and free of BPA and artificial sweeteners. Oh, and they’re also gluten-free and soy-free. The Ample Meal shakes are made of 54 percent premium, healthy fats and include 27 percent protein. Everything included is organic, and falls under the category of a diabetic meal replacement shake. The shake is 400 calories and, shockingly, only includes four grams of sugar. 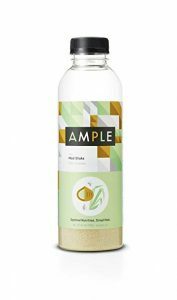 Ample Meal’s flavor is creamy and frothy and includes a hint of sweetness with notes of vanilla and cinnamon -- all while remaining gluten-free. Amazing. Additionally, Ample Meal is shipped in pre-portioned containers to which you’ll just need to add cold milk or water in order to make your delicious beverage. Don’t worry about storing a big, bulky container of powder that you’ll need to portion each day. And you won’t need to fall back on a ready-to-drink container, either. Nope, Ample Meal is the best of both worlds. It’s also certified hormone-free (meaning no rBGH or rBST) and is void of artificial sweeteners, colors, and flavors. BioTrust tops our list so far when it comes to protein inclusions with an impressive 24 grams of protein that come from humanely-treated, pasture-raised, grass-fed cows. 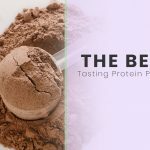 Plus, the protein blend is time-released, meaning that your body’s appetite will be sufficiently curbed and you won’t need to worry about suddenly eating a bunch of food right after enjoying the shake that is supposedly replacing your meal. 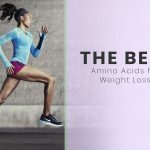 Additionally, a compound called ProHydrolase — BioTrust’s proprietary enzyme — helps the product absorb in a smoother fashion, all but eliminating the stomach problems and bloating that often comes with high-protein supplements. You can enjoy BioTrust Low-Carb, Grass-Fed Whey Protein Powder in as many as eight different flavors, including but not limited to chocolate peanut butter, cafe mocha, peach mango, strawberry banana, vanilla, and more. The 310 meal replacement shake option is in line with every other product on this list as being gluten-free, and adds soy-free and sugar-free to its list of allergens that it avoids. There are no artificial flavorings or sweeteners included, either. It is loaded with 15 grams of Tri-plex proteins, including pea, hemp protein, and brown rice. There is also a high concentration of fiber, which works with the proteins to improve and encourage lean muscle development. All of the above will fight hunger, too, so you shouldn’t need to worry about supplementing your meal replacement shake with additional snacks, although there are only 90 calories per serving -- easily clocking in at the lowest number on our list of eight gluten-free meal replacement shakes. You can find 310 in five different flavors: chocolate, salted caramel, strawberry, vanilla, vanilla chai. The starter kit includes both chocolate and vanilla. Invigor8’s Superfood Shake is completely gluten-free and includes zero GMOs. And not only that, but the protein included is premium, grass-fed whey protein, and everything is done right here in the United States in an FDA-registered production facility. Invigor8 goes the extra mile by including both pre and probiotics, as well as immunity boosters. That means that this shake will improve your gut health, as well as help your immunity system feel better as a whole. 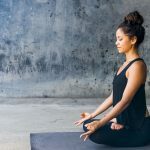 And not only that, but the third-party testing that has been completed suggests that the ingredients included in Invigor8 will also help improve brain function, too. 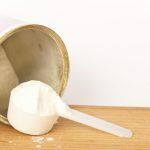 The aforementioned premium, grass-fed whey protein comes in an amount of 20 grams per serving, which puts Invigor8 in the upper tier of the gluten-free meal replacement shakes that we reviewed for this article. There are also 2,500 mg of green vegetable complex included as an added bonus. And the benefits don’t stop there, either. 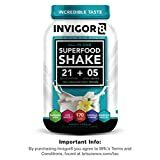 Invigor8 also has raw coconut (provides a metabolism boost), colostrum (boosts the immune system), and Omega 3, 6, and 9-rich chia and flax seeds. The superfoods included are kale, spinach, alfalfa, chlorella, and broccoli. You can purchase your batch of Invigor8 in two flavors, chocolate brownie or french vanilla. The only real potential downside to this product is that it only includes 170 total calories per serving. It’s a vegan gluten-free meal replacement shake that is also non-GMO and includes zero added sugar. On the “pros” side of things, each serving includes rich phytonutrients and antioxidants, all sourced from the best organic superfoods from around the world. UB Super’s product also includes ample amount of pre and probiotics to enhance gut health with the proper digestive enzymes. Plus, the included Hyaluronic acids assist with support to encourage healthy skin and joints. When you purchase UB Super, you’ll be getting either “Vegan Chocolate” or “Vegan Vanilla”, and the product will be arriving at your doorstep in a 16-ounce container. 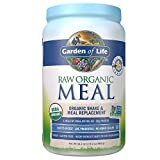 Garden of Life Meal Replacement is a raw, USDA-certified organic, kosher, non-GMO plant-based protein powder that can be purchased in flavors ranging from vanilla, vanilla chai, lightly sweet, and chocolate. There are 20 grams of clean, organic plant protein, 44 superfoods, and 21 vitamins and minerals included in each serving of Garden of Life’s products. The superfoods include but are not limited to fruits, veggies, and organic grass juices. Additionally, there are six grams of fiber per serving — and don’t forget the added bonus of probiotics. Your shipment of Garden of Life will arrive in either a 16-ounce or 32.1-ounce container, or in a similar total amount but divided into individual serving packets. Simply pick the quantity that fits what you need best, wait for it to arrive, and enjoy. PlantFusion’s offering is, of course, gluten-free, as well as dairy-free, non-GMO, and vegan. Again, another dairy-free and gluten-free meal replacement shake option. It’s also free of all other major allergens, including soy, rice, eggs, nuts, fish, tree nuts, and shellfish. The product has 18 grams of plant-based protein per serving, as well as eight plant-based supplements and a balanced ingredient list that includes plenty of fiber, greens, digestive enzymes and probiotics, superfoods, omega fats, and vitamins. There are 200 calories per serving, which is palatable and fairly middle-of-the-road for what we came across. 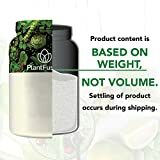 You can buy PlantFusion in either a one-pound or two-pound tub, or in individually-portioned, single-serve packets of powder. 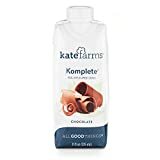 Kate Farms’ Komplete Meal Replacement Shake includes 16 grams of plant-based protein while the product remains not only gluten-free, but also vegan, dairy-free, soy-free, and corn-free, greatly reducing allergy concerns. Kate Farm’s product’s 16 grams of protein is actually organic plant protein geared towards accomplishing goals such as maintaining and repairing lean muscle and encouraging cell growth. Additionally, this shake has a low glycemic index, which allows your body to appropriately digest the nutrients delivered by the supplement. There are 24 vitamins and minerals included in Kate Farms’ Komplete Meal Replacement Shake, plus antioxidants from 29 superfoods. Each shake has 290 calories -- an adequate number that puts it pretty much in the middle of the pack for the products that we reviewed. You’ll find flavors including vanilla, coffee, and chocolate; the flavoring is all-natural with no chemical additives or artificial sweetener. In terms of the best gluten-free, dairy-free meal replacement shakes out there, this one is right near the top of the list. Perhaps this goes without saying — or, at least it should — but before you make a final decision on which meal replacement shake you’re going to go with, make absolutely sure that the shake that you’ve chosen is indeed gluten-free. 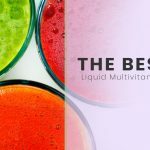 Our list is a great list, but we would strongly encourage everyone to read the ingredients list on each product before purchasing, and certainly before consuming, each product. Remember what we said at the start of the article about which nutrients were the most important? That’s right, calories and protein. You’ll recall that they both contribute to hunger control, and that protein is an important player when it comes to building and maintaining muscles. All that said, be sure to pay attention to those totals. We had options on this list that were all over the board, although the majority fell in the 200 to 400 calorie range. While the lower-calorie options are still viable, you may need to plan on enjoying a healthy snack or side item to supplement those meal replacement shakes. Also, be sure to consider the many additional benefits that many of these products offer. 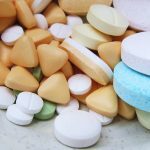 This might be the inclusion of superfoods, real fruits and veggies, significant amounts of vitamins and minerals, pre and probiotics, additional antioxidants, or a unique or proprietary blend of protein. In other words, as long as you’re at it in terms of finding a gluten-free meal replacement shake that fits your needs and has a taste that you enjoy, be sure to consider what the extra benefits each of the options might be able to provide. And even if it’s simply a tiebreaker to choose one product over another — at least at the start — ancillary benefits are absolutely something that should be taken into consideration before your purchasing decision. Oh, and don’t forget: consult with your doctor before making any changes to your diet or exercise routine — and that includes beginning to use meal replacement shakes on anything resembling a regular basis. While meal replacement shakes are widely considered to be healthy and effective when utilized properly, it’s always best practice to make sure your physician is aware, and ideally, approves of the changes you’re making. There are plenty of outstanding options on this list and elsewhere, but ultimately, it’s up to you, the consumer. Do your research, check with your doctor, and get to choose a gluten-free meal replacement shake!